While it may be too late for some of you to heed Ms. Angela Martin’s advice on the proper Halloween attire, it is never too late to turn your inappropriate life around. 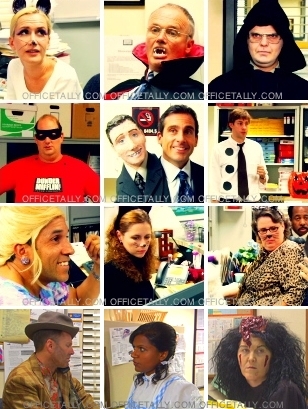 Are you having an Office Halloween? For the newest Halloween costume ideas, go to OfficeTally’s Halloween archive. Time for dress up — what are your Office-inspired Halloween costume plans? You could go as one of the characters, dressed in normal garb, as this group did for an Office Premiere Party (click here for more photos). Please note the attention to detail in both the attire and the hairstyles. Attached to a paper mache likeness of your own head. And be sure to also check out GMMR’s Jim Halpert and Pam Beesly costume tips! Icons courtesy of sheedy at the LJ Office Icon community. Ever since then, “The Office” has paid almost as much attention to iTunes as to NBC. For example, “because people are watching more than once, it’s become one more reason for us to to be very careful to include subtle things as well as broad physical stuff,” Lieberstein says. The iTunes effect hasn’t hurt in attracting big-name directors either; Harold Ramis will direct an hour-long episode to air around Christmas, while “Lost’s” J.J. Abrams is on board for a February one. Uh, ex-SQUEEZE me? An HOUR-LONG episode?! Did I read that right? 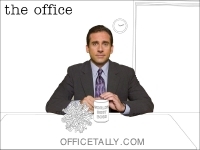 Read How iTunes saved ‘The Office’ and post your thoughts. Update: Jenna’s confirmed that yes, there will be an hour-long Office Christmas special next month! A supersized episode this month, and a superDUPERsized episode next month. YOWSAH! NBC says: “By this week’s end we’ll also have 2 Dunder Mifflin and 1 new Office logo t-shirts online as well — all from Roots. Plus an Office Christmas Tree ornament …” These items are currently available at the NBC store in New York. I’ve just updated the OfficeTally wallpaper archive with a collection created by rhythmdev. If you’re wondering why the wallpapers look vaguely familiar, rhythmdev hand-sketched them from the Season 3 promo photos. Peruse the wallpapers and leave a comment for rhythmdev here. UPDATE: for the newest Halloween posts, go to OfficeTally’s Halloween archive.